Three hundred years ago this summer, King George I of England (and, you may recall, the American Colonies) commissioned Handel to write and perform “music suitable for a concert on the River Thames”. This was the genesis of the three suites we know as “Handel’s Water Music”. The Daily Courant reported that the King and his party (mostly aristocratic ladies of impeccable breeding and doubtful morals) boarded the royal barge at Whitehall Palace about 8 PM on July 17 and were taken upriver to Chelsea. The tide was rising, so the current was strong enough to enable the barge to dispense with its oarsmen. A rather less splendid barge containing Handel and his 50 musicians kept pace alongside, enabling the King to enjoy the world première performance of Handel’s work – in fact, he insisted on hearing the suites three times that evening on the journey to and from Chelsea. As a tercentenary tribute to Mr. Handel and his Water Music, Music in the Somerset Hills is proud to present an outdoor, on the water performance of this work at the Lake Club in Far Hills on Saturday, June 24 at 8:30 PM. On a platform built out into the lake (no royal barge being available), Stephen Sands will conduct the well-known early music ensemble, The Sebastians, in performances of the Water Music and a contemporary work almost as famous, the Spring and Summer movements of Vivaldi’s Four Seasons. As well as being the final concert in MISH’s 2016-17 concert season, this event will be part of the yearlong celebrations surrounding the centenary of the Lake & Game Club of Far Hills. Membership of the club is not necessary to buy tickets for the concert. Bring a picnic, if you wish. Gates open at 6:30 – concert begins at 8:30. Parking $10 per vehicle. Chairs are provided in the VIP section. If you purchase a General Admission ticket, please bring your own chair or blanket. The rain date is Sunday, June 25. If it is raining again on Sunday, the concert will move indoors to The Pingry School in Basking Ridge. All Sales are final! There will be no refunds. Tickets are also available by sending checks to Music in the Somerset Hills at P.O. Box 729, Bernardsville, NJ 07924. Include a valid email address and phone number on your check. 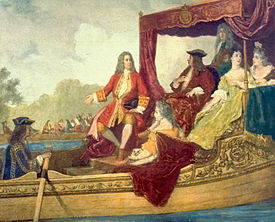 Above: King George I receives Handel on the royal barge July 17, 1717. Painted 150 years after the event by the Belgian artist Edouard Hamman.